Looking back on Tuesday the 3rd of April, I can still say it was one of the best days of my year. 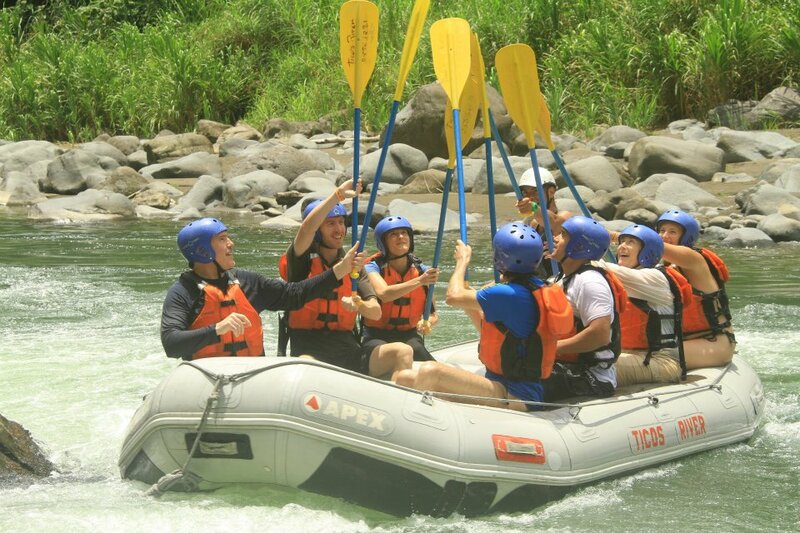 This is the day I went white-water rafting for the first time on Costa Rica’s Rio Pacuare. The rapids are classed as III-V which is pretty high on the scale (VI is the highest), and the route takes you down a beautiful stretch of the river with jungle covered banks filled with monkeys, waterfalls and numerous birds (including the photogenic toucan). But we didn’t spend too much time birdwatching, as there were some mighty rapids ahead, and the adrenalin was pumping! This first one is the larger version of my current blog header. Pretty striking! The devil is in the detail, there is so much going on in this picture you could look at it for a full 5 minutes. I’ve always been interested, at least on some level, with graffiti. On my trip around South America I came across such a wide variety, I decided to start taking pictures of it. 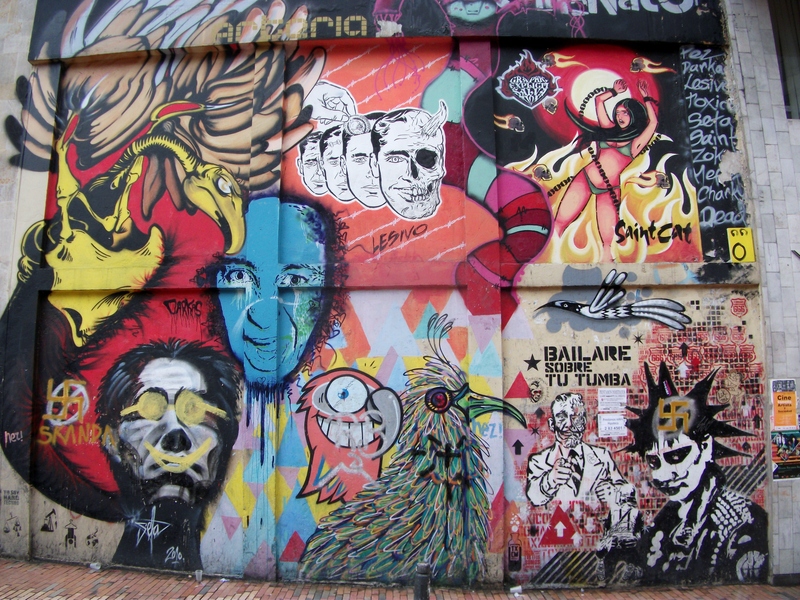 At it’s best, graffiti is thought-provoking, funny, shocking, political, controversial, and sits with the best art around. It’s art at street level, it’s not meant to sit in a fancy gallery for an elite cultured aristocracy. It provides a voice for the voiceless, a creative outlet for people who may not have the means to communicate any other way. Of course, not all graffiti reaches those heights, some is just nice to look at, and some is totally bland and uninspiring. The pieces I’ve added below have interested me in some way, whether it’s the message behind them, the technical skill of the artist, or just a striking composition. First up is Bolivia, and the little town of Copacabana on Lake Titicaca. 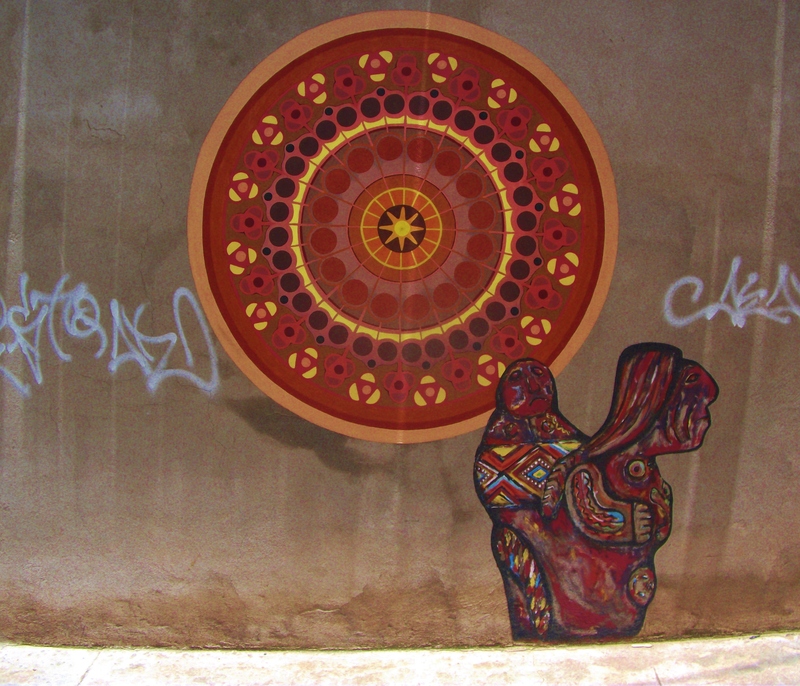 This piece is a bit of a cross between graffiti and indigenous art. For our final overland journey in South America (Cartagena to Bogota), we decided to take one more long distance bus. I suppose it was fitting then that the bus should be delayed for ten hours thanks to three accidents, countless roadworks and the drivers getting lost. The first of the accidents involved the earlier service from the same company we were travelling with, and we picked up those passengers at the side of the road. Several of them were crying but we never found out what happened. Ah South American buses, how we will miss you. 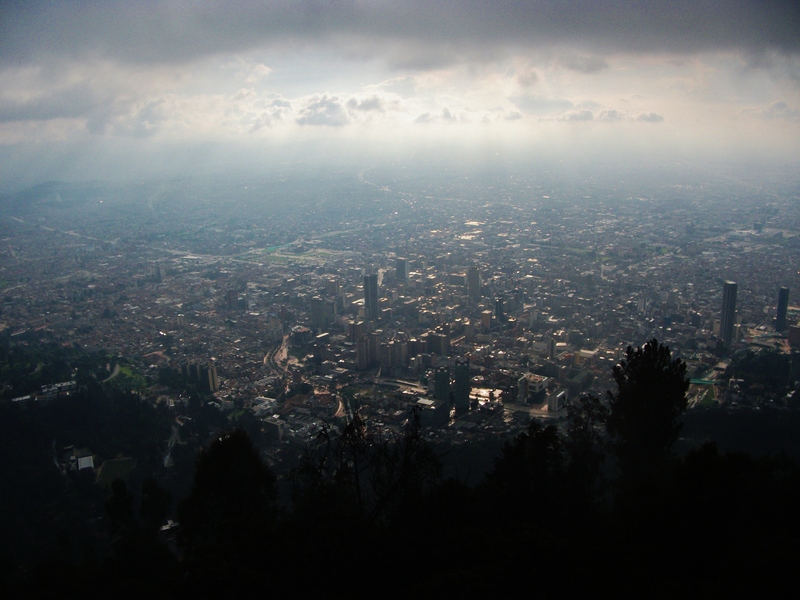 By the time we arrived in Bogota, it was nightfall the next day. As they opened the hold and handed out the bags, the bus driver picked up a box, the handle snapped, and a pile of dead fish in water fell out on the street. Needless to say, we were glad to get in a taxi and leave that bus behind! We slumped into bed knackered, and piled on the thick blankets against the first cold night we’d experienced for some time. The next day we took a cable car up the steep side of Cerro de Monserrate to view the city from above. The city is 2,625 metres above sea level, and the top of this mountain takes you up to over 3,100 metres. So it’s a pretty good view! The beauty of Playa Blanca cannot be overstated. It stares you right in face with a piercing gaze. This is a tropical paradise as seen on the old Bounty adverts. And in order to fully appreciate its beauty, you need to spend the night on the beach. You need to do this because at midday every day boatloads of people arrive; families with screaming kids, doting couples, pushy sunglass-sellers, the elderly… it’s like a human zoo. But by four o’clock all of the day trippers have jumped back on the boats and suddenly you can stroll the white sands in peace. The place is transformed! 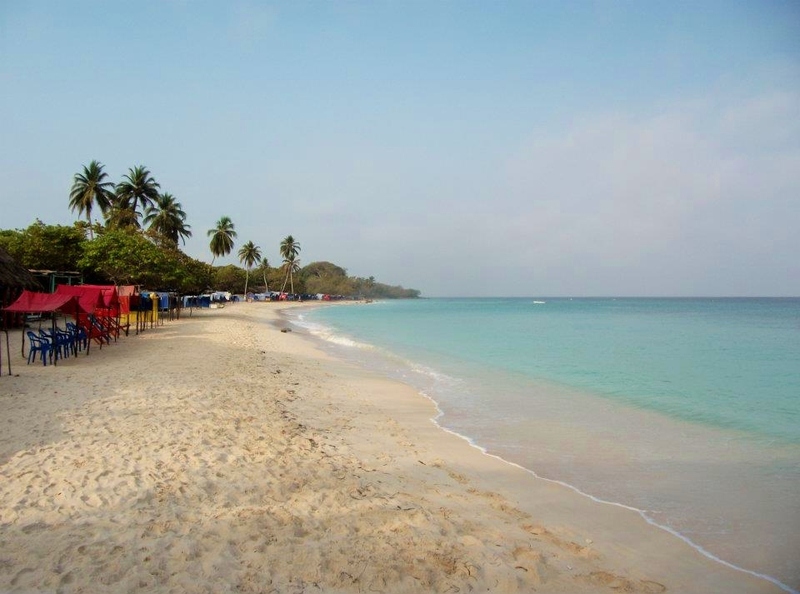 (Well, ahem, some of the doting couples still remain… and have been joined by a few bands of dreadlocked travellers, but it’s still much more tranquil). 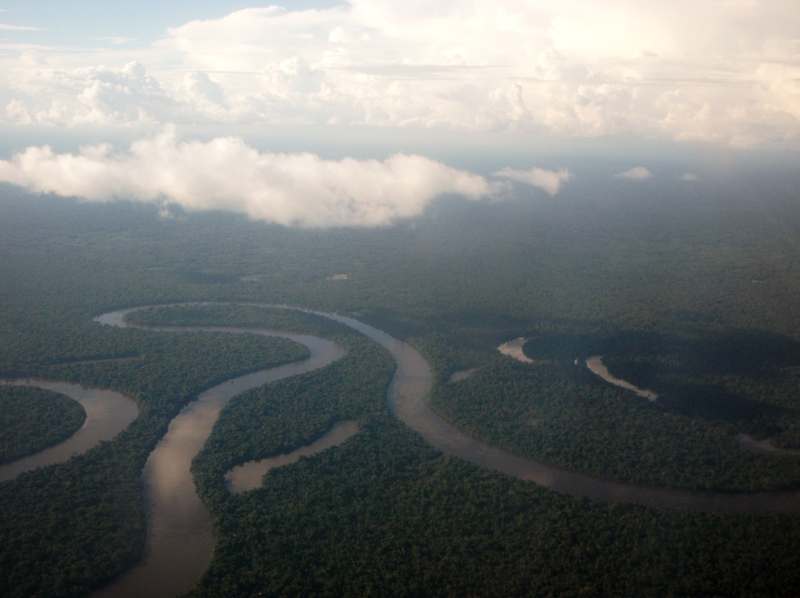 Iquitos is the biggest city in the world without any roads leading to it. To get there we had to take a three hour flight over the rainforest, and when the clouds cleared, the view from the window was pretty spectacular.